Belgian Thomas De Gendt blasted an all French jury for naming Warren Barguil as the race’s most aggressive rider. 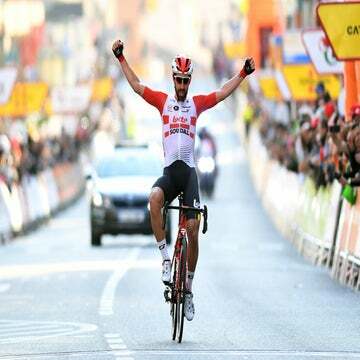 MARSEILLE, France (VN) — Belgian Thomas De Gendt (Lotto-Soudal), who spent 1,280 kilometers in escapes in the Tour de France, blasted an all French jury for naming Warren Barguil (Sunweb) as the race’s most aggressive rider. De Gendt failed at winning a stage with his attempts, but at least wanted to take the overall Prix de la Combativite home. Instead, Frenchman Barguil — winner of two mountains stages and the climber’s jersey, received the nod. De Gendt won the Mont Ventoux stage in 2016. This year, his long effort to Rodez nearly paid off. It at least earned him the combativity prize for the day. The panel votes on the most aggressive rider of the day and after three weeks, awards the super-combativity for the Tour. It does have an international flavor with Greg LeMond voting and public input coming via Twitter. The three-time American worked for Eurosport during the Tour. The rest of the panel includes Frenchmen Jean Montois (AFP), Alexandre Roos (L’Equipe), Laurent Jalabert (France Télévision) and Thierry Gouvenou (Tour de France). “I’m too disappointed to go deeper into it. I’d like to go home right away, but I will do my utmost to make it a sprint on the Champs-Élysées today,” De Gendt added. “Let me be clear: Barguil rode a fantastic Tour and he deserves everything. But a mountains jersey is for the best climber, a stage win is for the strongest guy of the day, and the points jersey is there for the most consistent sprinter. De Gendt shared in Twitter the public’s vote, showing an overwhelming win for him. The jury panel would have taken that into consideration in its decision. In the past, riders gained points that put them in contention for the prize. Since 2003, a jury votes for it daily. Last year, Peter Sagan took home the overall super-combativity award.